KAMPALA– Several former Flying Squad Unit (FSU) operatives are in hiding while others have fled the country after ISO and CMI operatives arrested several members of the police unit after getting more leads that they masterminded the murder of former police spokesman Andrew Kaweesi last year, PML Daily has learnt. Kaweesi, who also doubled as director for human resources, lost his life in a hail of bullets on the March 17, 2017, a few metres from his home in Kulambiro, a Kampala surburb. He was killed alongside his bodyguard Corporal Kenneth Erau and driver costable Godfrey Mambewa. Last week, the CMI and ISO operatives are said to have arrested former FSU operatives Martin Kimbowa, Chris Ahimbisibwe and Moses Kasibante. As a result, several former FSU operatives are said to be hiding while others fled the country following the arrest of Kitagenda. Kitagenda himself is said to have left the country for Canada after Kaweesi’s murder and only returned recently. He is said to have been processing a visa to Canada in different names. Sources said CMI were tipped off by Internal Affairs ministry officials after Kitagenda tried to secure a new passport in other names. Highly placed security sources told this website that CMI and ISO operatives are hunting for more suspects, including Jonathan Baroza, the former Personal Assistant of detained former police chief, Gen Kale Kayihura. Operatives picked Ahimbisibwe from Bushenyi where he has allegedly been hiding. Sources further intimated to this website that one of the arrested former FSU operatives revealed that they had interfered with the Kaweesi murder investigation. 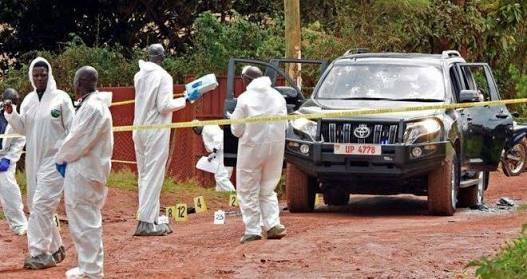 The ISO investigators then led him to the scene of crime in Kulambiro and reconstructed the murder scene, lending further credence to the previous conclusions by Forensic experts from the government analytical laboratory that Kaweesi’s car would have been stopped by someone familiar to him before the shooting. This is because, sources added, the vehicle after the shooting was found in proper stop mode with the headlamps all switched on and handbrake engaged. Sources familiar with the investigation have further told this website that Kitagenda confessed that he stopped Kaweesi’s car before he, his driver and bodyguard were sprayed with over 150 bullets. Kitagenda’s confession, sources said, also implicated former FSU boss Herbert Muhangi, who is being detained, and former head of Crime Intelligence in police Atwooki Ndahura, who was on Friday charged and sent to the military prison. Sources further told this website that the police officers on several occasions worked to frustrate the Kaweesi murder investigation. They are said to have been conducting parallel investigations intended to frustrate the one led by ISO. It is the reason, sources add, that in October last year, ISO operatives clashed with police at the home of former Kaweesi’s girlfriend Christine Muhwooza Mbabazi in Lungujja in Rubaga division. Police unit led by Flying Squad Commandant, Herbert Muhangi tried to force their way into the compound that was under the control of ISO. Special Forces Command later intervened and it is believed that Mbabazi knew the killers of Kaweesi, the reason the FSU wanted to silence her. The FSU group is said to have also made arrests of wrong suspects and even coached them to confess to the murder. Sources said one of the suspects whom the police had presented was later taken to the scene of crime to reconstruct the murder scene but ISO investigators were shocked when the suspect did not even know the scene of crime. It is said the FSU operatives often arrested their own suspects and took them to Nalufenya where they coached them on how to claim responsibility for the murder. It is the reason most suspects were set free by court. The High Court in Kampala has ordered government to compensate the 22 tortured suspects in the murder of AIGP Kaweesi with Shs80 million each. To date only 22 suspects have been charged and arraigned before the Chief Magistrates Court while other over 20 suspects have either been released or detained for a year without trial. With the exception of Abdul Majid Ojerere, Umar Maganda, Ahmada Shaban Ssenfuka and Ibrahim Kissa who were rearrested and slapped with fresh charges, 19 suspects were released on bail by the Nakawa Chief Magistrates Court.